Renault says that the new Megane Coupe-Cabriolet will offer even better performance due to a stiffer chassis. MUNICH -- Renault completes the renewal of its Megane family of compact cars with the launch of its new-generation Megane Coupe-Cabriolet. The car will make its debut at the Geneva auto show next month and go on sale in the spring. It will compete against the Peugeot 308 CC, Ford Focus Coupe Cabriolet and Opel/Vauxhall Astra TwinTop. The sixth body type in the Megane lineup keeps the large folding glass roof found in the current model, but the new model provides extra comfort during open-air driving with the addition of a fixed-glass wind deflector located behind the rear headrests. The car's fully automatic two-part roof opens in 21 seconds. Renault says that the new Megane Coupe-Cabriolet also will offer even better performance due to a stiffer chassis and a new electric power steering system. The car will come with a choice of seven different gasoline and diesel powertrain options. The dCi 110 DPF variant can be mated with Renault's new six-speed dual-clutch automatic transmission, which offers smooth, fast shifting while providing CO2 emissions and fuel consumption comparable to those of a vehicle equipped with a manual transmission, the company said without provide detailed performance data. New Megane Coupe-Cabriolet is manufactured alongside the Scenic and Grand Scenic minivans at Renault's Douai, France, plant, which is were the current-generation of the coupe cabriolet is produced. 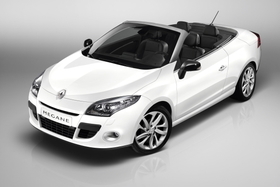 The new Megane Coupe-Cabriolet will share the stand in Geneva with another open-air Renault: the new Wind roadster. The car will compete against models such as the Peugeot 207 CC when it goes on sale in Europe this summer. The two-seat model has a folding hardtop that opens in 12 seconds.